California will create the world's largest regulated commercial market for recreational marijuana, as dozens of newly licenced shops open for business up and down the state. It becomes the sixth US state, and by far the most populous, venturing beyond legalised medical marijuana to permit the sale of all cannabis products to customers at least 21 years old. Colorado, Washington, Oregon, Alaska and Nevada were the first to introduce recreational sales on a state-regulated, licensed and taxed basis. Massachusetts and Maine are on track to follow suit later this year. With California and its 39.5 million residents officially joining the pack, more than one-in-five Americans now live in states where recreational marijuana is legal for purchase, even though cannabis remains classified as an illegal narcotic under US law. The marijuana market in California alone, which boasts the world's sixth-largest economy, is valued by most experts at several billion dollars annually and is expected to generate at least a $1 billion a year in tax revenue. Uruguay became the first and only country to legalise recreational marijuana sales through its pharmacies in July 2017, but it is far smaller in comparison, with a population of just 3.4 million. Most California jurisdictions are sitting out the highly anticipated New Year's Day inauguration of recreational cannabis sales. Many, including Los Angeles and San Francisco, will not be ready for days or weeks because of additional red tape required by city and county governments before would-be retailers can obtain their state licences. But business will almost certainly be brisk at newly permitted shops ready on day one. They number about four-dozen outlets across California. 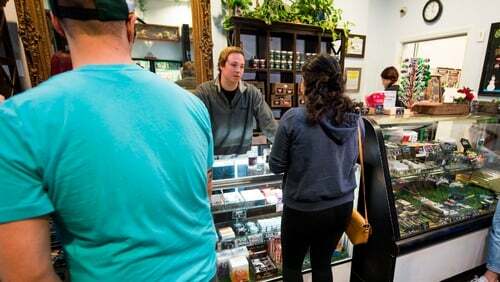 Shops authorised to carry recreational cannabis were set to go in San Diego, San Jose, Santa Cruz, Oakland, Berkeley, Eureka and Desert Hot Springs. Hundreds more are expected to open throughout the state as the year progresses. Many previously operated strictly as medical cannabis dispensaries under a patchwork of local regulations and will now be licensed by the state for recreational merchandise as well.